The 6-min walk test is a simple clinical outcome measure, which has been used frequently to assess functional performance in many different patient groups, including patients with total knee arthroplasty (TKA). The 6-min walk test measures the maximal distance a subject is able to walk in 6 min. 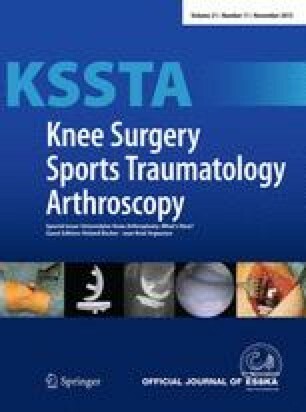 The reliability is unknown in patients with TKA. Therefore, the purpose of the study was to assess the reliability of the 6-min walk test in patients with recent TKA. Thirty-four patients with TKA performed 2 test trials the same day, separated by a 1-h seated rest. To assess reliability, intra-class correlation coefficient (ICC2,1), standard error of measurement (SEM), and smallest real difference (SRD) were calculated. The patients walked on average 14.1 m longer at the second (397.2 m) compared to the first (383.1 m) test trial. The ICC2,1, SEM, and SRD were 0.97, 13.0, and 36.1 m, respectively. The intra-tester reliability of the 6-min walk test was high in patients with TKA. The thresholds of the 6-min walk test to detect a real change are acceptable in research (SEM) and clinical settings (SRD). We recommend that the longest distance walked in 2 supervised test trials should be used. We thank the physiotherapists working at the counties of Copenhagen, Frederiksberg and Hvidovre for helping recruiting patients; and Anette Paulsen and Rie Bjørnebo Rasmussen, BS students, Faculty of Physiotherapy at Metropolitan University College, Copenhagen, for collecting the data. The authors declare that they have no conflicts of interest. The study was supported in part by grants from The Lundbeck Foundation Centre for Fast-Track Hip and Knee Arthroplasty; Praksisfonden, Danish Regions and The Danish Foundation for Research in Physiotherapy. Neither of the funding sources had any influence on the design, execution, analysis, or reporting of the study.